Adams world's best suction cups | Suction Cups Direct. Adams hold a PhD in Suction Cup-Ology. See below. 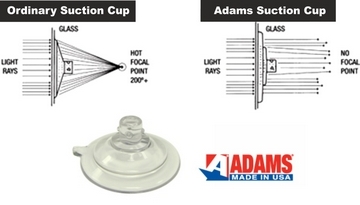 Adams Suction Cups in many types and sizes for everday use are often imitated but never duplicated. Visit our home page to see our range and why companies choose Adams. Beware of inferior, look-a-like Chinese manufactured copies with "world's best" claims. Only Adams are the original and genuine world's best everyday suction cups made 100% in the USA for over 40 years and exclusively distributed in the UK and Europe from our warehouse in the UK. Patents, trademarks and copyright of Adams products are strictly protected by law and are always vigorously defended by legal action for any infringement. Adams have led the way in developing exclusive materials, moulds and processes over the last 40 years with extensive R&D. During that time, they have developed a deep understanding of how gravity, atmospheric pressure and surface irregularities affect performance dynamics. Adams skilled design engineers are committed to looking at suction cup performance down to the molecular level. These insights are then applied to the design and in the manufacturing process at exacting tolerances to ensure consistent quality at every stage of the suction cup production process. Adams groundbreaking Light-Diffusing Ring™ technology prevents surface damage. Patented light diffusing rings stop a suction cup acting like a magnifying glass in strong sunlight. Ordinary clear suction cups concentrate light to a focal point which can damage interior surfaces behind the cup such as upholstery, curtains, car seats and dashboards. Due to thicker cross sections and superior finished moulded surfaces, Adams suction cups are tested and rated to hold a weight* that is based on the mm diameter of a suction cup with hook on glass. iii. the closing jaws of a self closing cup. 3. Crystal clear clarity for professional looking suction cups. Adams suction cups will not turn yellow or become brittle like many cheap inferior ones found elsewhere. Adams Manufacturing Corp. USA are over 95% into a rolling production change using their own PVC formula for their Phthalate-free suction cups. 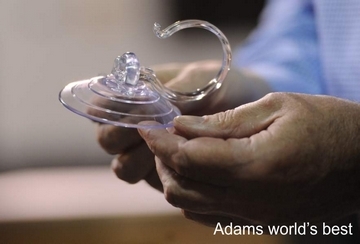 Adams was the first global manufacturer to do this for their whole range as standard. 5. Exclusive UV stabilised proprietary PVC material. 6. Hold better for longer than other everyday suction cups due to thicker cross sections, advanced design engineering/R&D and superior-quality U.S. sourced materials. 7. Quick release tab on suction cup edge. Using fingernails underneath the suction cup edge to remove, will cause tiny scratches on the inside and will damage the cup edge. Air can then flow back under the suction cup and ultimately compromise the cup's suction ability. Adams quick release tab (except double sided) removes the suction cup without damage to the cup or mounting surface. Use indoors and outdoors. Temperature and humidity variations may make a suction cup lose its grip. MINUS 29°C (-20°F) and +49°C (120°F), but should first be applied dry above 5°C (40°F). 9. Adams Suction Cups with screw stud have brass nuts - not plastic ones as seen on cheaper versions elsewhere. 10. Adams strong hooks are "U shaped" for brush-past safety and not "V shaped" like many others. Adams strong hooks are thick plated steel or non-brittle clear Polycarbonate. Adams Suction Cups compared to Snap Lock Lever Hooks and Turn Knob Devices. Adams suction cups hold better than an equivalent size of a "snap lock" lever type suction cup. Snap lock levers and turn knob devices pre-load the cup by using the mechanism of attaching the cup to the lever or knob within the casing of the device. This results in a greater pressure differential between the outside and underside of the suction cup and can allow the air to migrate faster as it relies on the suction cup edge only for a seal - the lever/turn knob suction cup is continually trying to be pulled away from the applied surface. Suction cups that "smell" are literally losing their ability to hold molecules as they leave the inner surface. Adams suction cups are made of a proprietary blend of materials that keep them working better and longer than any other cup. A related issue is the appearance of the inner surface. Adams cups are shiny on the underside because any matt finish or insufficiently polished mold automatically means that air is going to leak in through the seal, causing cup failure. The laws of physics being what they are - any suction cup with less than a glossy finish on the underside, around the edge and extending into the cup, simply cannot stick as well. Adams Mfg. Corp. USA produces the world's best everyday suction cups. They've made hundreds of millions (have they made a billion?) of them over the past 40 years. Often imitated but never duplicated - no other suction cup on the planet delivers the holding power, crystal-clear clarity, unsurpassed safety or value of Adams "Made in USA" Suction Cups.